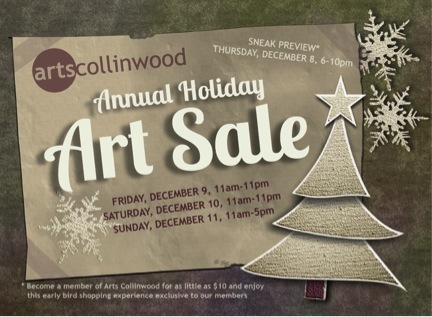 Arts Collinwood Holiday Art Sale & Sneak Peek! Become a member of Arts Collinwood for as little as $10 and enjoy this early bird shopping experience exclusive to our members. The evening will include wine and light appetizers, a live performance by the Carnegie Brass Trio, holiday drink specials in our Café, first pick at the work of over thirty of the regions best artists, and of course, lots of holiday spirit! Shop local this holiday season at Arts Collinwood’s Annual Holiday Art Sale featuring over 30 of the region’s best artists. The Arts Collinwood Holiday Art Sale has become a popular Cleveland destination and a draw for holiday shoppers from around the city, featuring a wide array of unique, affordable artwork including: wearable art, award- winning jewelry designs, prints, adorable baby items, museum quality paintings, exquisite glassworks, luxurious knitwear, beautiful holiday cards and much more. Take advantage of free childcare while you shop from noon-4pm on Saturday and Sunday. Enjoy lunch, dinner or cocktails in our adjoining Café. The Café at Arts Collinwood features a full bar with a great selection of microbrews, wine and espresso drinks, as well as soups, salads, sandwiches and daily specials. Also, enjoy live music Friday and Saturday night with no cover charge. Knock more off your gift list by strolling down Waterloo Road for fabulous sales at all the vintage, record, clothing and toy shops. Revel in all the festivities the Waterloo Arts District has to offer this special holiday weekend! For more information about the Holiday Art Sale at the Arts Collinwood Gallery, or any of the events in the Waterloo Arts District, visit us on Facebook or at http://www.artscollinwood.org or by calling 216-692-9500. Only 10 minutes from downtown Cleveland, just north of I-90 on the corner of E. 156th and Waterloo. This entry was posted in arts, cleveland, exhibits, galleries, ohio, photography and tagged art, arts collinwood, cleveland, exhibit, exhibition, gallery, ohio. Bookmark the permalink.